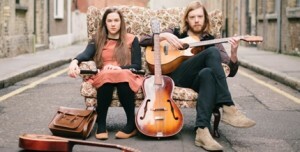 Josienne Clarke and Ben Walker | The Goose Is Out! Josienne Clark and Ben Walker were previously known as Mondesir. They supported The Martin Simpson Trio when they appeared at the Goose in 2010. Josienne’s music largely languishes in folk chanson, but occasionally dips a toe into blues shoes. A blend of skilful songwriting distilled through folk, bluegrass and traditional influences to create expansive works of skill and beauty, executed with dexterity and charisma. Josienne’s songwriting and performing cohort is Ben Walker on both steel and nylon string acoustic guitar, and mandolin. Influenced by the likes of Bert Jansch, Pierre Bensusan, Martin Simpson and Richard Thompson, his playing adds an additional dimension to her already sculpted sound. Click here to listen to Josienne and Be’s music on MySpace! Click here to go to Josienne and Ben’s website! We hope to get Josienne and Ben back to the Goose in the not too distant future!